Uh oh… Someone’s in trouble! Say hello to Teddy’s Burger of the Month, the Double Trouble Burger. 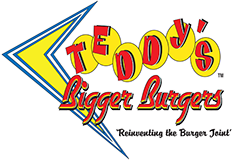 Stacked high with Teddy’s colossal 10 ounce Monster Double patty, the Double Trouble Burger also oozes with American cheese and is smothered with sweet, grilled onions. Now that’s an equation for trouble! Just one bite into it and you’ll be rewarded with delicious, meaty juices all over your hands and plate, so better have those napkins ready. However, the trouble doesn’t end there. This month, the Double Trouble Burger just so happens to be paired up with Teddy’s Shake of the Month: creamy, decadent Hazelnut. This delicious shake may look and taste innocently sweet, but it also has a nutty side. Are you up for this daring pairing? Throw caution to the wind and take a chance. It’s December, so we’re sure Santa wouldn’t mind the double trouble on his naughty list. Happy Holidays from all of us at Teddy’s! Celebrate a cheers to 2013 with a Double Trouble Burger!